From West:Take the Long Island Expressway (Route 495) east to Exit 41N toward Route 107/106. Bear to your right when the road forks to stay on Route 106. Travel approximately 4 miles (6.4 Km) north to Route 25A. Make a right, and travel east for 4 miles (6.4 Km). A sign marking Bungtown Road precedes the entrance to the Laboratory. Make a left at the traffic light. You will see a lighted CSHL sign and a large gold Victorian house by the entrance. You have gone a little too far if you pass route 108. From East: Take the Long Island Expressway (Route 495) west to Exit 44N which is the Seaford Oyster Bay Expressway (Route 135) north. Take Exit 14E toward Woodbury. Turn Right onto Jericho Turnpike (NY-25 E). Make a left onto South Woods Road and follow to its end. Make a right onto Cold Spring Road and merge onto Route 25A eastbound. A sign marking Bungtown Road precedes the entrance to the Laboratory. Make a left at the traffic light. You will see a lighted CSHL sign and a large gold Victorian house by the entrance. You have gone a little too far if you pass route 108. From South: Take Southern State Parkway to the Seaford Oyster Bay Expressway (135) north. Go to exit 14E Jericho Turnpike. Make a left on South Woods Rd. and take that to its end. Make a right on Cold Spring Rd. and merge onto 25A going east. A sign marking Bungtown Road precedes the entrance to Cold Spring Harbor Lab. Make a left at the traffic light. You have gone a little too far if you pass route 108. 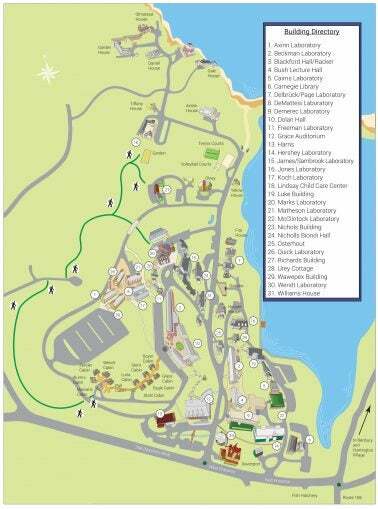 Directions to Human Resources: Once you enter the CSHL campus proceed straight ahead to the stop sign. Approximately 100 feet after the stop sign, you will come to a fork in the road. Bear right and drive to the harbor. You will now be facing the harbor. Make a right turn. The harbor will now be on your left. Go to the third building on your right (beige building with green trimming). The name of the building is David & Fanny Luke. Parking is available in front of the building. Using the Long Island Expressway (495): go to Exit 46 (Sunnyside Boulevard). At the traffic light turn onto Sunnyside Boulevard and drive north (approximately ¼ mile). You will approach the Genome Research Center’s gate entrance. Using the Northern State Parkway heading east: go to Exit 38 (Sunnyside Boulevard). Turn onto Sunnyside Boulevard and drive north until you can drive straight no further. You will approach the Genome Research Center’s gate entrance.